Dr. Lewis Jackson, Xenia, Ohio (left) and C. Alfred "Chief" Anderson, Tuskegee, Alabama in the cockpit of a disassembled Waco UPF-7 vintage aircraft being rebuilt and refurbished in the yard and garage of George "Sky King" Vaughn on Hoover Avenue in Dayton, Ohio. During World War II Dr. Jackson was the Director of Training and Mr. Anderson was the Chief Flight Instructor for the 66th Army Air Corps Flight Training Detachment at Tuskegee's Moton Field. The UPF-7 was one type of aircraft used to train cadets. The cadets who successfully completed the program were transferred to the advanced flight training program conducted at the Tuskegee Army Airfield (Sharpe Field). Dr. Lewis A. Jackson of Xenia, Ohio was born in Angola, Indiana, December 29,1912. While in grade school, he constructed model airplanes and read about cross-wind landings in encyclopedias. 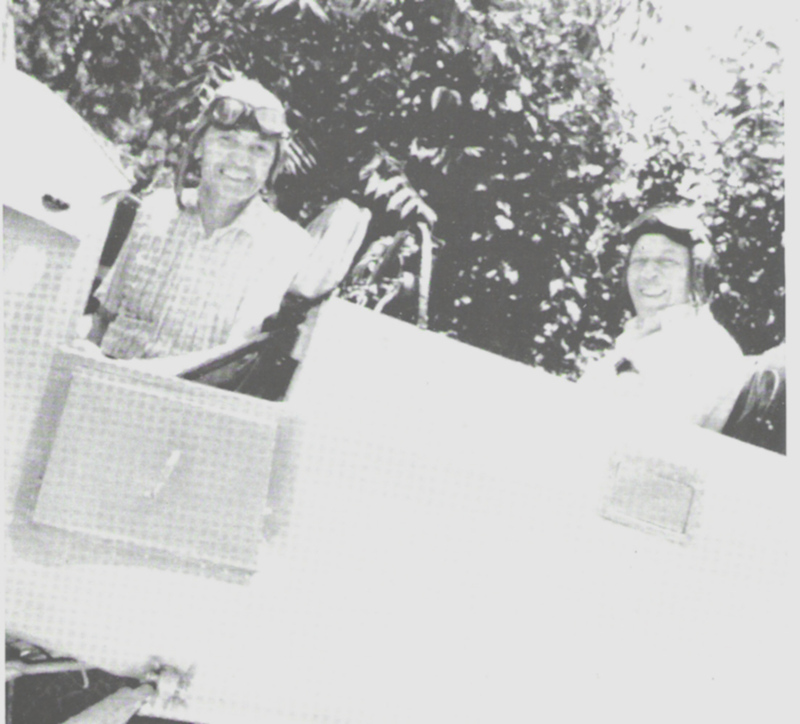 He had his first ride in an OX5 Swallow in 1927. In 1929, he designed and flew his own hang gliders-biplane and monoplane. At seventeen, he purchased a partially completed Alco Sport Monoplane and installed a motorcycle engine on it. A wind storm destroyed the airplane before it was flown. American Eaglet, and a Curtiss Jenny converted to a parasol monoplane. Five different pilots provided this instruction, after which Jackson soloed in his own Waco 10 in 1932. From 1932 to 1937 Jackson barnstormed throughout Indiana and Ohio, earning money to pay his way through college. In 1937 he acquired the Transport Pilot's License in northern Indiana. In 1939, he was re-rated converting his Transport License to a Commercial License with Instructor Rating. The same year, Jackson earned a B.S. degree in Education at Indiana Wesleyan University, taught public school, and also pursued aviation activities. After the war Jackson moved to Ohio where he became an FAA Flight Examiner and tested over 400 pilots for flight certification from 1947-1960. He developed an aircraft computer called a NAV-KIT which was used by many pilots in obtaining their licenses. Other activities included a multi-engine rating and appointment to the Citizens Advisory Committee, FAA, President of Experimental Aircraft Association. Chapter 382 for three years and Experimental Aircraft Association technical adviser as well as membership in Aircraft Owners & Pilots Association and the OX5 Aviation Pioneers. In 1948, Jackson obtained a Master's Degree from Miami University, Oxford, Ohio, and in December, 1950 a Ph.D. in Higher Education from Ohio State University. The title of his dissertation is A Study Of Aviation Courses and Facilities in Higher Education in the United States with Predictions and Future Trends. He spent a year as Associate Professor of Aviation at Ohio State University. Jackson has also produced an unpublished book entitled, The New Fundamentals of Flight. President for Administration at Sinclair Community College. One of Dr. Jackson's great interests was in entrepreneurship. In 1974 he fostered the business entrepreneur program at Sinclair Community College. He firmly believed that more students should think as employers and thus be more self- reliant; that, in this way, students would be taught to create employment. Jackson received many honors: Distinguished Alumnus Award, Indiana Wesleyan University Alumni Association; Frontier Award, First Frontier Inc.; Pioneer, Achievement, Trail Blazer Award, Links, Inc.; Special Recognition, Ohio Department of Transportation, Division of Aviation and Federal Aviation Administration; Certificate of Appreciation, Xenia Area Development Corporation. Jackson served a number of years as a member of the Greene County Regional Airport Authority and the Board of Directors of the Xenia Area Development Corporation.